In the United States, its hard to imagine, even impossible, a government-mandated day of silence. A day where electricity is cut, police roam the streets, normally bustling roads are empty, and no one is to leave their property from 6 AM one day to 6 AM the next. This tradition though still exists in a far off paradise, when once a year, religious Hindus on the Indonesian island of Bali totally unplug and focus in on welcoming their new year with full and rapt attention. Hari Raya Nyepi is the Balinese Hindu New Year, celebrated on the first new moon in March. On this day of self-reflection and peace, lights are extinguished, airports are closed, markets are shut down, and silence is mandated. 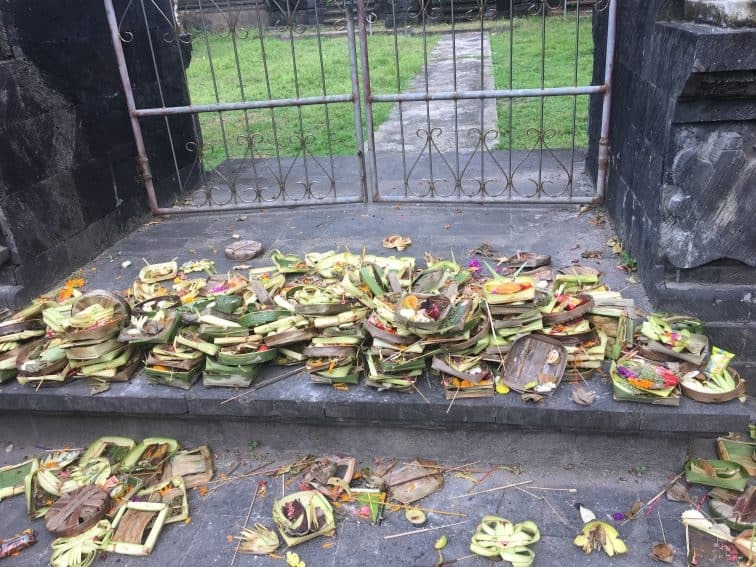 On this special day, even tourists or non-religious Hindus are required to abide by these strict rules, out of respect for the untouched culture of this uniquely Balinese tradition. Though Hinduism is found throughout Asia, Nyepi is only practiced in Bali. Hindus in other parts of Indonesia do not even take part in the holiday. Celebrations are centered on Bali and take two forms. Firstly, as Spring arrives, followers believe that the Lord of Hell sends devils to the Island, sparking their purification practices as the new year approaches. This is done through daily offerings, prayer, ritual baths, and on the eve of the holiday and the day itself, villagers run through their towns in facepaint and costume making noise and ruckus in an effort to spawn off the evil forces. In large parades in every single village, the spirits are scared off by massive handmade, intricately designed paper-mache effigies of evil spirits called "Ogoh Ogoh". These unsightly creatures are remade each year, demanding copious amounts of organization, planning, resources, and time to create. Ogoh Ogoh is paraded throughout the neighborhoods with all the villagers behind it, dressed in their pure all-white outfits, men with rice stuck to their forehead underneath their white headpiece, and women in beautifully colored sarongs and flowered hair. The night before Nyepi, the effigies are burnt in a traditional ceremony, followed by dancing, drinking, and feasting, before their 24 hours of absolute solitude. So many other traditions and symbols are seen throughout the Nyepi holiday. "Mesabatan Api", a ritual where people are hit atop the head with burning coconuts, symbolizes the purification of the body and universe through the fire before the dawn of the new year. Traditional Balinese security official, essentially the religious police, also known as Pecalang, patrol the street during Nyepi to ensure no noise is coming from inside homes, and no one is out of their property. Omed-Omedan, another Nyepi tradition, is the annual "kissing festival". One day after the Day of Silence, young Balinese Hindus first gather to play, then attempt to kiss and dance with each other as spectators egg them on and douse them with water, all in attempt to ward off any bad luck in the year ahead. When tourists hear that an entire 24 hours of their stay in Bali will be spent quarantined in their electricity-free accommodations, it is understandable why they may avoid these dates when planning a trip to the paradise. However, I encourage anyone who has the time in their schedule or Southeast Asia trip's itinerary to actually seek out Bali during Nyepi. Of course, ensure you have plenty of time to explore the paradise on normal days as well, but witnessing Nyepi is an unusual, once in a lifetime chance to witness and an age-old tradition, basically untouched by modern technology. Nowhere else in the world would people tolerate the government forcing electricity providers to shut down for a day. But in Bali, Nyepi is taken incredibly seriously by villagers, followers and non-religious folk alike. It is there a true sense of identity. Unlike other Indonesians, unlike other Hindus, Balinese followers are like no other in the world. Let the discomfort of the unknown entice you on your next trip to Bali, and make an attempt to visit during this less-busy, still an incredibly beautiful time of year. With deep traditions of intention setting, self-awareness, and relaxation, maybe the Western world could take a hint from this un-plugged day of silence. thanks for your nice description of Nyepi. I don’t know when you wrote this article, but I can report that actually, electricity is not cut on Nyepi day. Since 2010 I’m living in Bali each year from October till May, in a small village 15 north from Tabanan, where I rent a small house, and this year I even had my internet connection working until noon (suppose the provider company forgot to switch it off until then). But I never saw electricity cuts during Nyepi. And when people stay in a hotel in the tourist area, even if the local government would cut electricity, the hotel probably has a generator. The idea behind the very noisy parade is that the demons will be scared away, and the next day (Nyepi) when they might come back, but see the island deserted, they might look for another place (island) to disturb the people there. In my village, during Nyepi, from 1pm on, many people were walking around the street, chatting with each other, children rode their bicycles, youngsters played a sort of baseball, there was some gambling going on, it was a very nice atmosphere, without motor bikes, cars etc,. and probably in many villages the same thing occurs. In other villages, the Pecalang (ethnic ‘police’) might be more zealous in forcing the respect of silence and the other traditional restrictions. I even heard of a Pecalang throwing a big stone through a window of a house where electric light was burning….. (I tend to think that this particular Pecalang was possessed but a demon that hadn’t left Bali). In the same youtube channels quite some interesting videos I shot can be seen.